"The 214-Type submarine, 65.3 meters long and 6.3 meters wide, is equipped with Air Independent Propulsion (AIP) that helps improve its underwater capability. It can submerge to a depth of up to 400 meters and carry out underwater operations for a maximum two weeks at a time. "The submarine, equipped with eight torpedo tubes and advanced submarine-to-surface missiles, has a maximum dive speed of 20 knots and a seating capacity of 40. It costs around $1 billion. "The Sohn Won-il submarine will be declared operational in the second half of next year after undergoing sea trials, according to the Navy." 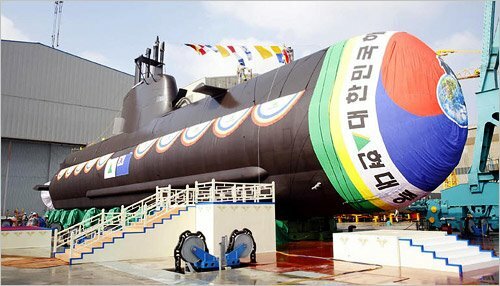 "Korea has become the first country to launch an AIPS submarine in Northeast Asia. Japan, a submarine powerhouse, is in the middle of building a 3,000-ton class submarine, the 16SS, which is larger than the 214s and equipped with AIPS. It will be ready by around 2008. Elsewhere, Germany, Sweden, Greece, Italy and Russia either have or are developing AIPS subs." I admit that I was surprised to see Greece on the list; they're not known as a big sub-building country. Sure enough, though, three Type 214s for the Hellenic Navy are scheduled to be built in the German-owned Hellenic Shipyard over the next few years. For the South Korean Navy, though, they recently announced plans to build six more of the Type 214s, in addition to the three already started. Combined with their nine Changbogo-class Type 209s, they should have a force (planned to reach at 18 boats) that can deal with the North Korean's 97 less capable submarines (only 26 of which are full-sized boats, mostly old Romeos) quite easily. What happens when non allies start buying them? Skippy, maybe you should start worrying now...Maybe todays allies might be tomorrows enemies? Suggest you ask around how the Navy is doing playing with the Gotland, the Norwegian boat we leased to teach ASW to us...again.
? yikes, that's gotta be crowded. HMS Gotland is actually Swedish. Yup, my bad. Guess I've had a Norwegian fixation lately, comparing the LCS and the Nansen. BTW, Gotland had its lease extended another year, so it can continue playing tag with the ASW forces.